Shane Warne is a former Australian cricketer. He is widely acknowledged as one of the greatest bowlers in the history of cricket. The popular, charismatic and entertaining Shane Warne is not only one of Australia’s most successful sportsmen but also a superstar of global proportions. ‘Warnie’, as he is affectionately known throughout the cricketing world, is arguably the greatest bowler ever to play cricket. Shane is Australia’s highest ever wicket taker with 708 test wickets at an average of 25.42. Shane Warne was born to Keith and Bridgette Warne on 13 September 1969 in Ferntree Gully, Victoria, a suburb of outer Melbourne. Warne debuted for his first Test match in 1992, and took over a cumulative of 1000 international wickets in cricket. He is also famous for bowling ‘The Ball of the Century’ to England batsman Mike Gatting in 1993. Warne also proved himself to be a successful batsman; he scored over 3000 Test runs, and holds the record for scoring the most Test runs without a century. From the year 2007 to 2008, Warne played English domestic cricket for Hampshire, where he captained the Hampshire team for the said years. Alongside, he also played in the Australian domestic cricket for his home state, Victoria. 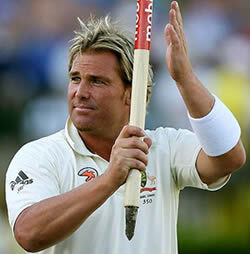 Shane Warne retired from international cricket in January 2007, at the end of Australia's Ashes series victory over England. Following his retirement, Warne played a full season at Hampshire in the same year. He was scheduled to appear in the 2008 English cricket season, but in late March, he announced his retirement from playing first-class cricket in order to be able to spend more time pursuing interests outside of cricket. However, in March 2008, Warne signed on to play in the Indian Premier League for the Jaipur team, Rajasthan Royals in the first edition of the tournament, where he played the roles of both captain and coach. He led his team to victory against the Chennai Super Kings in a cliffhanger match on 1 June 2008. Despite of having a phenomenal cricket career, ‘Warnie’ has not been left untouched by scandals. He was considered as a part of many controversies, which led to his ban from the matches; the scandals included to being tested positive for a prohibited substance, charges of bringing the game into disrepute by accepting money from bookmakers, and sexual indiscretions.